These loaded sweet potato skins make a great meat-free meal served with salad and guacamole. The skins from your pile of Batch-Cooked Sweet Potatoes give a healthy serving of fibre and are extra tasty with that oil-baked outer layer. There are two ways you can put this dish together. If you’re in a real hurry, you can simply assemble all the salsa ingredients, chopping the tomatoes up, then pile the salsa onto the skins and serve with salad. If you have a little more time, I would recommend taking half of your tomatoes, tossing them in a little olive oil and roasting them in the oven for 30 minutes. Allow to cool and then chop these along with the raw tomatoes to make the base for a deeper-flavoured salsa. You could, of course, plan ahead and roast these tomatoes at the same time as your SPs are baking in the oven. They can be stored in an airtight container in the fridge for another day. 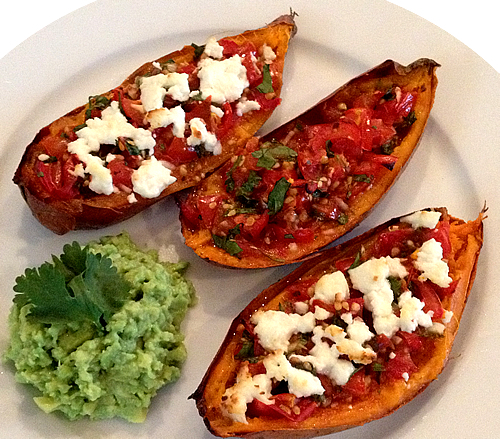 Place your 4 Sweet Potato skins on a baking tray and top them with the salsa. You can also top with some soft goats cheese. Bake in a moderate oven for 20mins. Do you like this recipe? Please LIKE and SHARE the love! Have you made this recipe? Please COMMENT below and tell me your experience!